Los Angeles, Calif. – On Thursday, Nov. 17, from 7-10 p.m., Freewaves will launch its most ambitious initiative to date, entitled Dis…Miss, with a reception at Los Angeles Contemporary Exhibitions. The reception will feature the work of 20 artists and artist collectives, together comprising a survey of the challenges facing feminism as its “fourth wave” emerges. Featured artworks address persistent issues prioritized by the second-wave feminist movement, such as workplace discrimination and sexual violence, combined with a third-wave awareness of the intersection of sexism and other forms of oppression, based on age, ethnicity, religion, or class. Finally, Dis…Miss examines how, and to what extent, contemporary feminism will adapt in response to society’s evolving understanding of the complexities of gender identity. The Nov. 17 opening reception of Dis…Miss will include projections of 25 original videos and the public debut of 10 artist-designed postcards, each posing a provocative question related to identity. Throughout the evening, performance artists will interact with the audience to encourage and facilitate participation, using the artists’ questions to begin a dialogue about feminism and gender. Opening Reception: Thursday, Nov. 17, 7-10 p.m.
Los Angeles Contemporary Exhibitions, 6522 Hollywood Blvd. Say passé to the sculpture in the square; the leading edge of public art is changing. Art is passing from isolation, to intervention, to participation, to engagement, to integration. that explores socially engaged art in Southern California from East to West. Join the dialogue with SoCal artists, scholars, activists, and administrators as we think about socially engaged art in relation to zoning, technology, ethics, food, ritual, performance, gentrification, museums, democracy, nature and art support structures in the here-and-now. Where is our collective dialogic imagination now? As many as of the talks as permissible were audio recorded and posted below. USC Price School: Is LA the Creative or Anti-Creative City? What are lines that our regulations and laws draw around the arts, exploring the edges between art and the city? Do artists represent only gentrification for our communities? How does art, and how do artists add value to urban life? How should planners consider art and artists? How do planning regulations aid the creation of a creatively vibrant city that adds not only economic value but also cultural excitement to the lives of urban residents? MAK Center, ARTISTS + INSTITUTIONS: What Is The Common Ground For Artists and Institutions? Salon-style discussions about collectives and artists-run initiatives, graduate programs in social and public practice, and museums dedicated to novel fulfillment of educational programming. Dialog prompts, generated by well-known artists and institutions, will be presented to the public for an evening of critical discussion and lively debate, comfortably hosted within the historic rooms and gardens of the Schindler house. organized by Kimberli Meyer (MAK Center), David Burns (Fallen Fruit) and Sara Daleiden (Los Angeles Urban Rangers); features artists Sarah Beadle, Notch, and Christina Sanchez; Special thanks to Whole Foods Market for their generous support. Occidental College: Can the Sidewalk be a Stage? Coordinated by artist Mary Beth Heffernan with support from the Center with Community Based Learning, the Occidental Office of Alumni Engagement, and the Department of Art History and Visual Arts. Fun, hands-on activities to help green the food desert and support sustainable change in the East L.A. food environment. Yash La Casa Market, 3968 Hammel at Hazard, in East L.A.
What Can We Learn from dOCUMENTA (13)? Through presentations from artists and curators who participated in or visited one of this year’s most important exhibitions in contemporary art, the evening will look at projects and reflect on the relation to social practice right now. What can we learn from the art projects, curatorial practice, expanded notions of location, pedagogy, and their intersections? ACLA Park, La Culebera: Can Artists Heal Nature in LA? artists: Hadley Arnold, Allison Behrstock, Olivia Chumacero, Sarah Dougherty, Janet Owen Driggs, Ron Finley, Anne Hars with Erik Knudsen, Mark Lakeman, Andy Lipkis, Jenny Price, Jane Tsong, and Tricia Ward. Potluck at 6 pm. Bring food to share, or just your utensils to help make this a zero waste event. Can Artists Use Technology to Enable Communities? Artists working on various civic projects with diverse goals will share one project each. A roundtable discussion will follow with questions about collective process and individual creation, technology’s assets and limitations, corporate and community involvement, documentary and artistic aspirations, and other complications. Prerana Reddy has been the Director of Public Events for Queens Museum of Art in New York City since 2005. Reddy also spearheads the Museum’s community engagement initiatives combining arts and culture with social development goals in nearby neighborhoods predominately comprised of new immigrants, including programs that address language access, healthcare, public space advocacy, and the mortgage crisis. is a time to gather around the fire and exchange knowledge and stories of indigenous history, culture and traditions, organized monthly by Olivia Chumacero. This event highlights storytelling by Tongvans. Anabolic Monument, Native Plant Garden ceremonial space, at north end of the Los Angeles State Historic Park, 1245 N. Spring Los Angeles, CA 90012. Parking available on Baker Street. Bring a blanket or chair to sit on the sand. Join in potluck dinner by bringing your own utensils. LACE: How Does Socially Engaged Art Happen in Los Angeles? Roundtable Workshop to explore the possibilities and limits of current organizational models and curatorial strategies that support Social Engagement Art practices. From trust building and community process to funding and timing, this session invites participants to grapple with fundamental questions — How to sustain a project? How to represent in the community? How long will the work really take? Getty Museum: Do We Need Artists in Art Museums? Does the role of an artist at museums stop once his or her art enters the collection and is displayed in the galleries? A growing number of museums are bringing artists into the fold – whether or not their art is displayed – and asking them to call on their own practices to devise creative opportunities for engaging diverse audiences and communities. This panel of artists who have engaged museum audiences, and museum staff who have engaged artists, explores how museums reach communities through artists, and asks whether this is true engagement or mere flirtation. Panelists include Mark Allen and Elizabeth Cline from Machine Project, who worked together on projects at the Hammer Museum; and artist Olga Koumoundouros, who created a Wall Works installation at the Santa Monica Museum of Art; Asuka Hisa, director of education and public programs at the Santa Monica Museum of Art; Bob Sain, former director of LACMA Lab; and Christoph Korner, a partner at GRAFT architects, which designed the Lab’s Seeing exhibition. Free; reservations recommended. Call (310) 440-7300 or click here. How Can Artists and the Eastside Generate Change Together? Is the community or the artists the protagonists? What is the role of the artist as community and vice versa? How can Artists/community drive the visioning and planning of an arts district before it happens? How do we move beyond participants, observers, beautifiers and “decorators” and into a more integrated part of development planning? Evonne Gallardo (Self Help Graphics), Sandra de la Loza (artist), Alfred Fraijo Jr. (LURN: Leadership for Urban Renewal Now), Elizabeth Blaney, Leon Mostovoy, Dont Rhine, Leonardo Vilchis, (members of groups Ultra-red, The School of Echoes, Union de Vecinos, Woodcraft Rangers) and visiting artist X. Andrade in residence at Outpost @ Armory. Faculty and students from the Roski School of Fine Art’s M.F.A. Program and M.A. program in Art and Curatorial Practice in the Public Sphere, as well as from the American Studies Program join together to discuss the implications of Occupy, the movement’s relationship and effect on academia and on the multiple artworlds, and the Capitalocentric nature of our economy. The panel will be followed by a discussion with the audience. A L Steiner, What Kind of Workers Are We? Go Metro and receive a FREEWAVES DVD. For more details, click here. Metro provides Bus and Rail transportation all over Los Angeles County. For your best route or more info on service till 2AM on Fridays and Saturdays, visit the Metro Trip Planner or call (323) Go Metro or (323.466.3876). While I know some people find art to be alienating, the intensely commercialized streetscape of Los Angeles can feel alienating to me. I wanted to find out if other L.A. pedestrians and public transit users felt the same way, and if putting art on the bus could be a force for de-alienation. In 2010, my organization started an ongoing project called Out The Window, which screens video artworks on the Transit TV monitors aboard LA Metro’s 2000 buses. In our first round, we screened 50 video artworks by local artists about Los Angeles. We surveyed 540 riders, and overwhelmingly, the response confirmed my hypothesis. When asked, “What would your video be about?, ” riders said they wanted to make films that would reflect and uplift the lives and spirits of their fellow bus riders. Inspired by riders’ profound reactions, we wanted to find efficient systems to reach new audiences inexpensively. Then, at the very same time, game designer Happy Dojo’s Joe Kim emerged out of the media-activist mist. Together, Freewaves and Happy Dojo developed a video art gallery app highlighting the most challenging and controversial Out the Window videos that didn’t make it onto the Metro Bus screens. The app, called Out the Window UNCENSORED, makes these videos viewable in the privacy of your own mobile device! Out the Window UNCENSORED is available for iPhones and iPads via iTunes for free until September 30th. Info about the videos concludes the app, so that viewers can compare their interpretations with the curator’s. If you’re among the culturally hungry, you can follow a link to even more artwork at the end of the app. Public – yet – personal media, and viewable from anywhere, Out the Window UNCENSORED offers new opportunities to bring art with you; to share on the bus, at a party, even at school. Art can go anywhere. This art is both collectible and sharable. iGallery! Is That Art In Your Pocket? These videos were intended for the L.A. Metro buses, but a few did not make it to public screens. Through this app, the most challenging and controversial videos are available for viewing in the privacy of your phone. Info about the videos concludes the app so viewers can compare their interpretations with the curator’s. Even more artwork is linked at the end for the culturally hungry! Los Angeles, Calif. – CELEBRATE with Freewaves and the artists the completion of “SEE CHANGE,” 2 groundbreaking video installations featuring 27 original, site-specific artworks, located in the lower-level arrivals hall of the Tom Bradley International Terminal at LAX, permanently accessible to the public. The reception, on Saturday, June 16, from 5 to 8 p.m. is free and open to the public. Parking will be validated. “SEE CHANGE” includes 2 large-scale displays: a 58-screen, 90-foot linear video filmstrip is suspended from the ceiling, and a 25-screen media wall. The installations provide 4 hours of original programming. People, SoCal objects, nature and places are the artists’ subjects. Half of them are from L.A. and some of them refer specifically to L.A. but all considered the factors: airport, waiting, and international travelers. The videos range from meditative to chaotic from heavily montaged to linearly documentary, and from digitally manipulated to hand drawn animations. Artists, engineers, curators, administrators and a programmer negotiated over 7 years to make this complex system come to life. Each artist took this colossal opportunity in a different direction; yet each explored the arena between space and time (3d to 4d), compressing or expanding “real time” of human eyes. 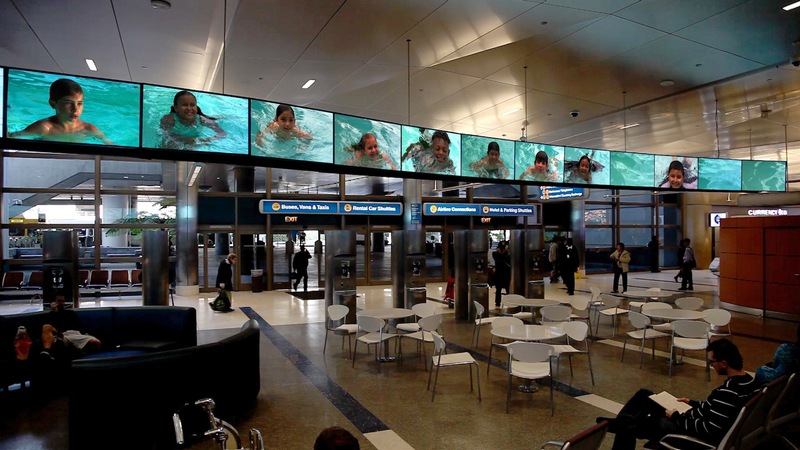 Trillions of pixels swim around the 80+ synchronized TV screens of video art at LAX. These many screens’ significant advantage over one screen is their accent on differences. Different images side by side beg for comparison. Difference is their norm. The modernists’ decisive moment has been replaced by many moments often from different angles, like from different window seats in a plane. Are you looking from the point of view of travelers, greeters, airport managers or cleaners? The multiple monitors of related images ask viewers to compare and contrast frames unconsciously. How they differ hints at artists’ intentions. Some present micro-changes between frames asking one to analyze subtle variations in nature, specific neighborhoods and distant cities. How similar are they? The meaning inhabits their differences, for example, are we careening around the world or spying on one patch of nature? The results remind us that motion is the blend of time and space. Categories can be blurrier than we think. Chance might play a role. The frames’ relationships show how far in time or space we have moved. Which place or time is right? Can they both or neither tell the truth? Can we separate them to see each independently? How many truths are there? Come to LAX to find out! When we are presented with something new, we instantaneously judge with minimal information regardless of being wrong or right. Allowing our perception to be clouded by volley of information, we absorb what we can from art and strangers. The short art clips of Aaron Bourget’s Rorschach Revelations and Lior Bar’s Israeli Jewish White Male uses different methods but both play with identity. As Rorschach Revelations’ images gradually become identifiable, labels keep being hurled on top of the inkblots, words contradicting images. Israeli Jewish White Male on the other hand uses a fixed approach with slight variations of specific words to suggest a controlled number of distinctions. Both clips display the power of the ideas and labels that are given to specific groups and simultaneously show how we struggle to shake the labels that we are given. Short videos, presented across the entire Los Angeles County Metro bus system, will share diverse perspectives on Los Angeles, as seen through the creative eyes of its young people for its 4400 existing TV screens on public buses. HOW Transit TV is donating use of their interactive TV system for the youth to screen their videos and question 1.2 million daily riders via text messages. WHY The newest innovation on the public media spectrum brings meaningful art and relevant topics to and from LA Metro’s underserved ridership while public media declines. The project links physical and virtual worlds through digital media portraits of places, offering views from different neighborhoods up to the city and region at large. Out the Window aims to create a mosaic of the many social, cultural, economic and creative layers of this complex American city. In reply, bus riders can text responses instantly or eventually to location-specific and thematic questions posed on the screens by youths, artists or community curators. Since Fall 2010, youth in Echo Park, Historic Filipinotown and East Los Angeles have been participating in a collaborative learning community, specifically designed to build digital media communication skills, including storytelling, technical media skills, social networking and critical thinking. Specifically, they are writing and producing one to three minute videos exploring aspects of community and place, to be seen on over 2,200 buses traversing Los Angeles County. The videos will be shown hourly on Metro buses over a week in June (6/13-6/19, 2011) and will be archived on the project website, www.out-the-window.org. Additionally, the website will provide resources, like media art centers where anyone can learn how to create digital media and ways to comment and submit videos for future screenings on the buses. “Place is the new identity politics. The youth in Out the Window examine this subject anew hopefully in dialogue with fellow commuters, 91% of who say they like art,” says Anne Bray, Executive Director of Freewaves, LA’s public media arts organization. The Metro buses crisscross Los Angeles’ diverse neighborhoods and social boundaries, passing unique, local cultural resources. Out the Window targets people and places where even the web doesn’t always reach. Sixty-nine percent of Metro riders live in households making $26,000 or less a year. Thirty-three percent of riders have no or rare access to the Internet, yet most riders have cell phones, which they use to text as well as call. Out the Window’s partners believe the riders represent a population who should be no less served by the telecommunication innovations that have emerged in the last decade. The videos and questions produced for Out the Window are created with this complex audience in mind. The videos produced by youth working with Echo Park Film Center are called The Sound We See: A Los Angeles City Symphony. Participating teacher Angelo J. Pompano says, “City Symphonies are motion pictures that capture the spirit and uniqueness of a city by assembling images of everyday life in that city. These abstract images of the city capture its heartbeat and expose its soul.” Over twelve weeks, teens and their artist-teachers explore the origins of the City Symphony and its contemporary relevance as students create their own 24-hour cinematic celebration of the dynamic metropolis that is Los Angeles. Public Matters is working with two groups of high school aged students. Students from the East Los Angeles Renaissance Academy are creating videos around healthy food access issues in their community including a series Have You Noticed? /Té Has Fijado? Students from Pdub Productions, a project in conjunction with Pilipino Workers Center, are creating pieces that explore Los Angeles’ Historic Filipinotown including a series entitled Hidden Hi Fi about the unknown, unexplored and unexpected facets of life in Historic Filipinotown. An additional series will explore the students’ own personal stories of immigration and migration. Who has the right to study and work in the U.S.? When people contribute socially and economically to a society, are they not citizens? Is there a way for the politically disenfranchised to feasibly gain American citizenship? On April 30 at 7:30pm, Freewaves, Self Help Graphics & Art, La Causa and TELA SOFA (The East LA Society for Film and Arts) will present DREAM + ACT, a selection of visual art and activism focused on immigration as it relates to communities in Los Angeles and beyond. Through film and video, DREAM + ACT will express multiple visions and viewpoints on the realities of immigration and how it affects us. We aim to build a community of dialogue and bridge the cultural communities in Los Angeles and countries around the globe. In addition to providing encouragement for film and video makers and activists, this event seeks to promote deeper understanding of our diverse city by presenting a wide array of perspectives on the complex issue of immigration. The community will be able to interact with the filmmakers to further explore the issues addressed. Plus a mini exhibition on graphic art related to recent immigration legislation. Marco Amador is the producer and investigative reporter of Yo Soy El Army and director of Centro de Comunicacion Comunitario. Exhibition of graphic art organized by Ernesto Yerena. This selection, from the Alto Arizona Art campaign, called on artists opposed to SB 1070 to take action and create an image. The act originated in Arizona and aims to identify, prosecute and deport undocumented immigrants. America Love Me poster by Grupo Bijari. Grupo Bijari, a collective of artists, urban planners, architects and designers from Säo Paulo, Brazil, created a map tracing the multi-layered network behind the issues of immigration and education in California. The artists conducted extensive research in Los Angeles as part of their project, America Love Me, for Outpost for Contemporary Art’s international residency program. Location Self Help Graphics & Art 1300 East 1st Street Los Angeles, CA 90033, across from the Metro Gold Line Pico/Aliso Station. Parking is limited in the area. We encourage people to take Metro (www.metro.net) and exit at the Gold Line Pico/Aliso Station. DREAM :: We believe art has the power to inspire, create new possibilities and broaden our perspectives so we can see our community through a different lens. ACT :: Not content to dream only, together we aim to provoke thought and inspire solutions to the challenge of immigration in this country—a challenge shared by people throughout the world. DREAM + ACT is a collaboration of TELA SOFA, Freewaves, Self Help Graphics & Art and La Causa. TELA SOFA’s mission is to offer a venue for all interested filmmakers, first-time through professional, to explore issues affecting our world today while connecting them with the Hollywood film industry. Self Help Graphics & Art (SHG) is a nationally recognized center for Latino arts that develops and nurtures artists in printmaking. SHG advances Latino art broadly through programming, exhibitions and outreach to diverse audiences in East Los Angeles and beyond and engages young and emerging artists from the community in all aspects of its activities. Freewaves is dedicated to the creative exhibition of the most innovative and culturally relevant independent new media from around the world. Freewaves facilitates cross-cultural dialogues by inventing dynamic new media exhibition forms at experimental and established venues throughout Los Angeles. LA CAUSA (Los Angeles Communities Advocating for Unity, Social Justice, and Action) engages historically disenfranchised young people and their families from East Los Angeles to take action against the injustices that impact low-income communities of color.